This alcohol-free setting spray can dew it all: giving your make up serious staying power and providing instant illumination, leaving the hydrated, dewy glow you’ve been searching for. Delivered as an ultra-fine mist and enhanced with glow-giving ingredients, the 100% alcohol-free formula delivers an even, luminous finish that’s perfect as a face and body highlighter – the more you mist, the most intense your radiance. Quick-drying, alcohol-free and instantly hydrating, this is the setting spray dreams are made of, preventing your masterful handiwork from fading or smudging in the most beautiful way possible. 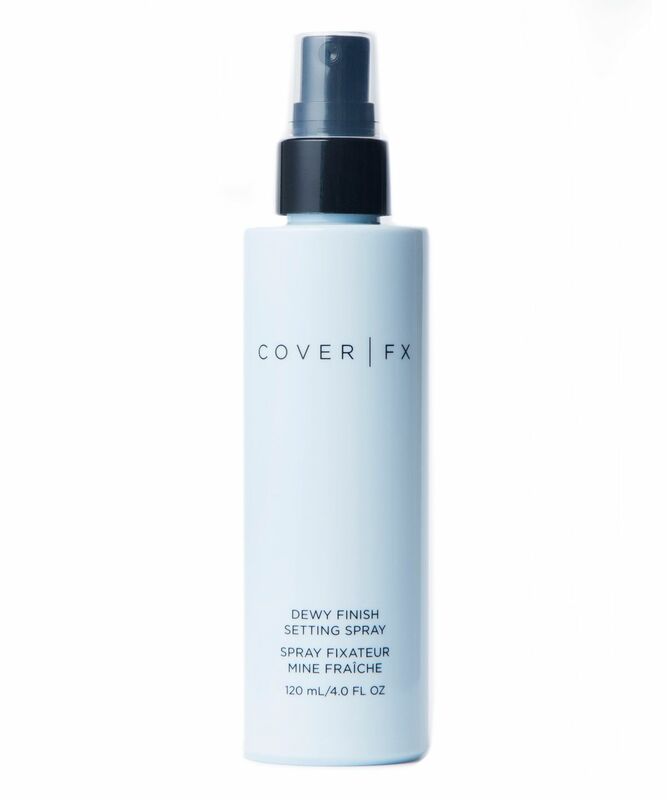 Delivered as an ultra-fine mist, Cover FX’s Dewy Setting Spray grants a gorgeously hydrated, dewy finish while giving your make up serious staying power, making it the ideal final step in your routine – and perfect for touching up your complexion throughout the day. Suitable for use on both face and body, it’s grants skin a naturally highlighted gleam – the more you mist, the more intense you glow. Pro-Tip: For an extra dewy boost, mist your makeup brush or sponge with this setting spray before you apply. You want a dewy look? This is it! Fine mist, no white dots, no alcohol or perfume. It gives the skin such a glow but if you’re anything other than dry, the glow can turn into ‘oily’ real quick so I always powder strategically and try to mist on the high points of my face. Love it! First off: No perfume, no alcohol! Thanks, CoverFx, Contrary to their Illuminating Setting Spray, this one does not make you look glittery but creates the dewy look it promotes. It does not feel drying nor oily, but it keeps a very subtle tacky (hydrating) finish instead of a powdery one. It keeps your makeup on as well! I prefer the Matte version if I want to be sure I have a super long-wearing result, HOWEVER, I have never let them directly compete against each other, take this with a grain of salt. The spritzer of this Dewy spray creates the finest mist I've ever experienced. You can use it really close to your face for a more targeted application (and to ensure that you don't waste product). Does exactly what it says, gives you a beautiful dewy finish with no chunky shimmers whatsoever. The mist is super fine and disperses evenly. Does not emphasize texture and melts powder products into the skin really nicely. Would 100% recommend it.